Preheat oven to 190°C/375°F/Gas 5. Lightly grease an 11 x 7”/ 28x 18cm Swiss Roll tin. Sieve the flour and salt into a bowl. Rub in the margarine and add sufficient water to make a soft dough. Turn onto a lightly floured board, roll out and line the Swiss Roll tin. Cover and leave in the fridge while making the topping. Melt the margarine in a pan over a low heat. Remove from the heat and add the sugar, ground almonds and strong flour. Mix well, then beat in the eggs and almond essence. Leave to cool a little. Remove pastry from the fridge; spread the jam over the top of the pastry base. Pour the topping over the jam. 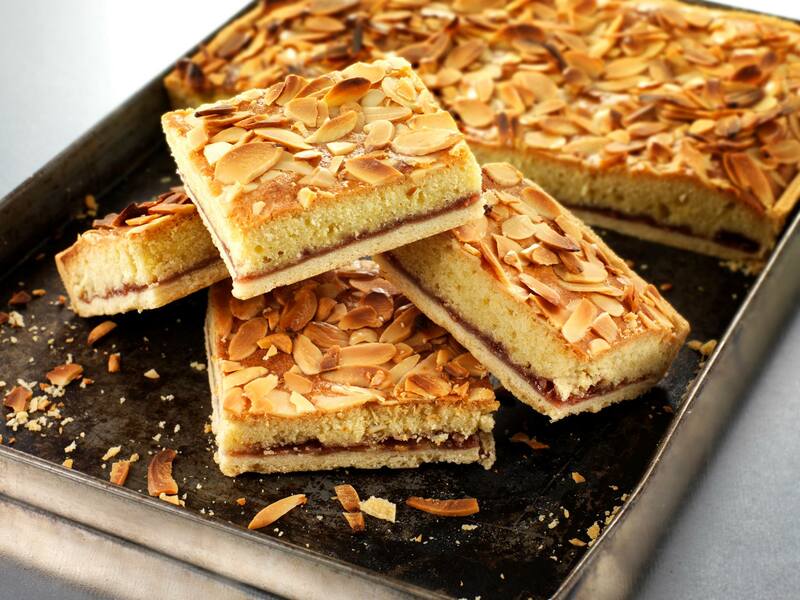 Decorate with flaked almonds and bake for 35-40 mins. until pale golden in colour.